Well, as promised we are moving from the 1930's to the 1940's and the war years. 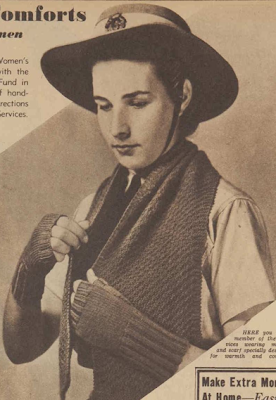 It seems that knitting remained a popular activity throughout the war years. While Europe suffered from the lack of wool Australia had enough supplies "of the finest wool that the world can produce" they wrote in 1946. "After six years of using fibres and rabbit wools and nothing but artificial textiles, the (overseas) designers took their inspiration from the days before the last two wars, when quality was the hallmark of distinction." 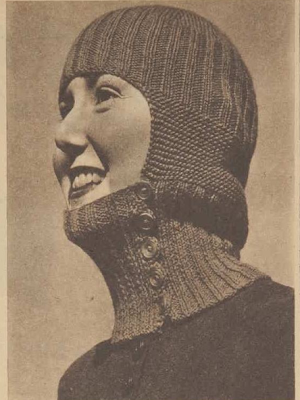 "With these the winter will be just like a long, sweet song to the girls"
"Cosy balaclava - side-fastening is a feature of this comfy hand-knit. It can be quickly adjusted without dragging or pulling of hair." Not the most charming item I must say...but wait, how about those gloves?! At the moment I spotted them I thought, those are different! 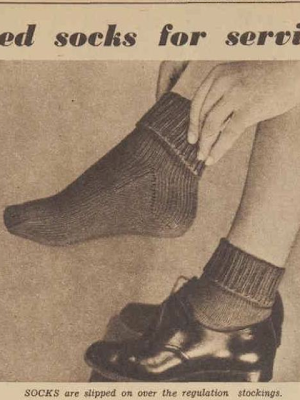 And I was right, because those gloves are knitted lengthwise instead of knitting in the width. This means: there is no need for 4 needles! There is no hard-to-make lacy pattern which makes them extra-pretty but a good old garter stitch which looks very contemporary and is super-easy to make even for beginners. A bonus: there are no adjustments needed for right or left hand glove. Another free pattern to make! I knitted up the gloves, tried different ways and wrote a lot of notes on how to make them successfully. If you can cast on stitches and knit in garter stitch, you can make them too! 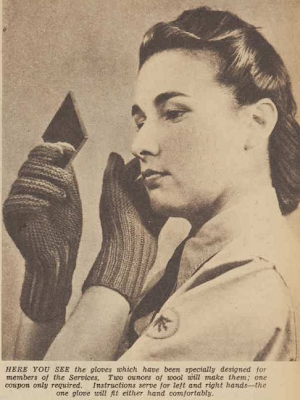 In the next post I explain how those gloves are constructed. In the post after that I include a detailed explanation on which techniques to use for the best results, plus the original pattern of course. 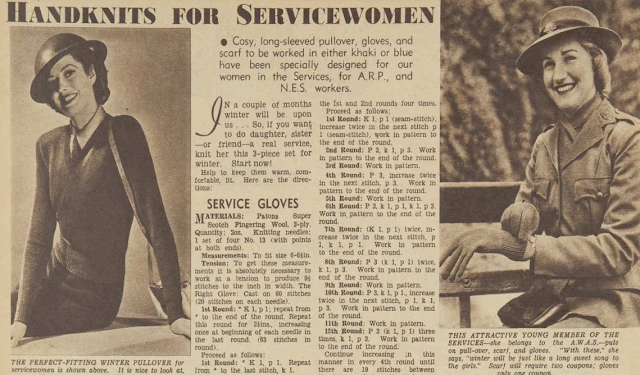 For the first part of the servicewomen gloves post click here and for the second part with lots of construction details click here.